We can supply a complete range of land surveying services. From topographical surveying to GPS surveys of land, construction projects and much more across West Wales. If you're starting or working on a construction project in South West Wales and require a site engineer to carry out site engineering on things like car parks, drainage, falls and levels. Our state of the art equipment gets things right perfectly, first time. We can produce floor plans and indepth 3D drawings of any building that we carry out measured surveys of. This can be achieved by tape measure, leica disto laser measuring equipment and by the use of total stations around Pembrokeshire and Carmarthenshire. From suveying, 3D Modelling and Site Drawings to Plant Hire and Groundworks. Here at L.A.H Contracting we offer a wide range of services from groundworks and plant hire to Land surveying and site engineering. With our extensive knowledge and the latest equipment we aim to provide high quality work to suit the customer's requirements at affordable prices. With surveys and site engineering our projects range in size from a few hundred pounds to multi million pounds. We provide a range of site surveying and land survey methods for any client around West Wales. We can also supply plant equipment to complete landscaping projects of any size, from borders and hedgebanks to lawn and soil preparation. From Car Parks to land drainage and site clearance. 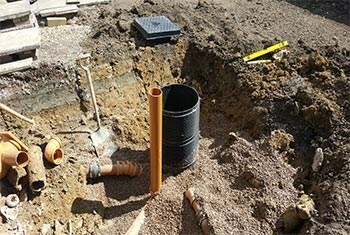 LAH Contracting have a years of knowledge and expertise in groundworks contracts and projects. For the removal of rubbish left on site through to land clearance of trees, brash and overgrowth. We provide a full site clearance service. Whether it's a small construction project on your home for a new septic tank or a large construction project, being built from scratch. We offer a complete site setting out service using the very latest in EDM Top Stations for sites around South West Wales. Our top of the range equipment allows us to produce a range of detailed drawings for any kind of site in any environment. From woodland to nature trails and of course construction projects through to Maritime surveys and marine surveying. You can visit our surveying pages to read more about our kit plus our services. For some clients, we've been able to provide a complete construction service. 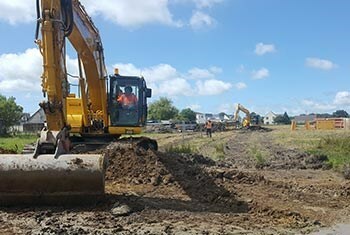 From the land drawings and setting out we've also been able to supply diggers and plant machinery to carry out landscaping, groundworks and more. To view these services, check out our dedicated page. Brynsiriol, Llandewi Velfrey, Narberth, SA67 7AA.